When you think of places with large Cuban communities outside of Cuba, the first place that probably crosses your mind is Miami. But Cubans migrated to New York City as far back as the late 1890s, during the Cuban War of Independence from Spain, with many laying down roots in Harlem. And as the New York presence of Cuban writers, poets, and musicians grew, so did their influence on American pop culture. Famed Harlem Renaissance writer Langston Hughes was influenced by Cuban poet Cirilo Villaverde nearly a decade before his time, according to Cuban-American Dr. Mercedes Diaz, an adjunct professor of communication at CUNY Bronx Community College. Harlem and soon the South Bronx flourished as the musical hub of the Cuban community through the mid-20th century as Cuban mambo and salsa found their space in the the jazz era. The Mambo Kings of Harlem and the South Bronx, along with the rise of Cuban singers such as Machito, Celia Cruz, and Graciela Orquesta in NYC, paved the way for many of the modern Latin sounds we hear today. New York’s Cuban community isn’t as concentrated in these areas of the city as it once was, as many Cuban-born and Cuban-American residents have branched out around the five boroughs and the metro area in search of other opportunities and more affordable housing. But the beauty of Cuban culture has become a permanent staple for New Yorkers and visitors alike, whether it be through music, dance, art, film, food, or drinks. Whether you’re Cuban or not, here are 11 experiences that embody that culture right here in the Big Apple. 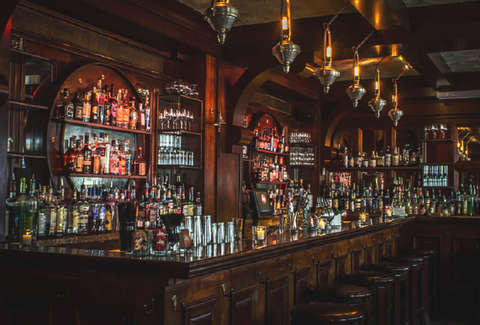 Would you believe us if we told you some of the the best and most refreshing daiquiris in New York are being served in the middle of Times Square -- at a quaint, jazz-themed, speakeasy-looking bar, no less? These aren’t the sweet, fruity-flavored, usually frozen concoctions you’ll find on beach bar menus; we’re talking the simple, original recipe of rum, lime juice, and sugar first invented in the town of Daiquirí, Cuba. 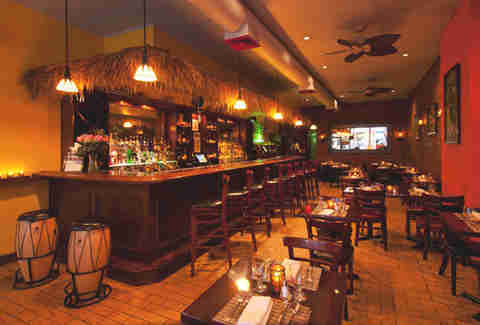 The Rum House, tucked away in the Hotel Edison on West 47th Street, serves a few different types of the drink, including a Hemingway Daiquiri, a doubly-potent version popularized by Ernest’s years in Cuba. Enjoy one -- of the classic, flavored, or dark varieties -- while noshing on empanadas and listening to the sound of old-school Cuban salsa and mambo music over the bar’s speakers. Brunch is a weekend social staple in NYC, and if you’re looking to start your Sunday with Cuban food, Havana Cafe in the Bronx is the place to go. Their brunch menu mixes classic American breakfast foods with those typical of the island nation, a feat co-owner Ruben Rodriguez attributes to the use of different spices. You can order scrambled eggs with chicken ropa vieja, waffles with chicharron de pollo (marinated fried chicken), or steak and eggs with chimichurri sauce and a side of platanos maduros (sweet plantains). For vegetarian and vegan customers, there’s vegetarian paella, quinoa salad, Latino-style hummus, vegetable pastelon (plantain lasagna), and a quesadilla made with soy cheese, which you can order from the dinner menu during Sunday brunch. While these items don’t necessarily follow traditional Latin recipes, the flavor is still classically Cuban. An homage to the famed poet, writer, and patriot of Cuba, Martí’s statue was dedicated back in 1965 and resides by the southeast corner of Central Park. One of Cuba’s revolutionary leaders, Martí fought for Cuba’s liberation from Spain from the late 1860s until 1895, when he was killed in battle. 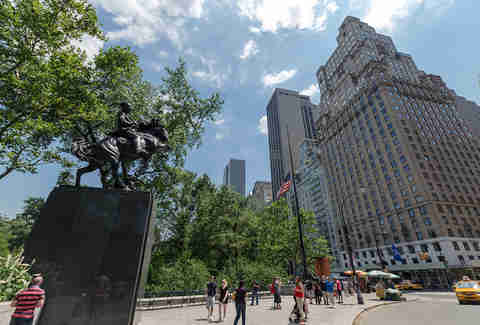 His statue is one of three liberators -- including Simón Bolívar and José de San Martín -- placed in that area to “honor Pan-American ideals and principles,” according to NYC Parks. It’s become a symbol of the Cuban-American relationship, too. After the US and Cuba announced plans to restore diplomatic relations in 2014, the Bronx Museum raised the money to create a replica of the Martí statue that they gifted to Cuba in January. Manuel Mendive’s work focusing on the Afro-Cuban community has made him one of the most popular Cuban artists of today; hundreds of his pieces are displayed around the world at venues including the National Museum of Fine Arts in Havana, the Museum of Modern Art in Paris, and the Ethnographic Museum of Budapest. The 74-year-old, Havana-born artist’s current exhibit, “Nature, Spirit, and Body” (through November 4 at the Bronx Museum) explores the culture of the Afro-Cuban ethnic group Yorùbá-Lucumí in a new series of paintings and sculptures. Start your visit by watching the video in the second room, which explains the origin and inspiration of Mendive’s artwork to a soundtrack of jungle noises. Best of all? Admission to the museum is free. While the exact origin story of the mojito has been lost to time, every version traces the cocktail’s invention back to Cuba. For one of the best takes on the drink -- made with rum, lime, and mint -- in the five boroughs, head to Amor Cubano in East Harlem, whose classic mojito perfectly balances the citrusy, sweet, and slightly minty flavors, and serves it with a stick of raw sugarcane. Visit the bar/restaurant from Thursday to Sunday nights, when you can drink your mojito while listening to a rotating lineup of live bands play Cuban genres like rumba, son, and rueda, as well as music from other Latin countries. Ropa vieja, a traditional Cuban dish made of shredded beef, peppers, and onions marinated in tomato sauce, is a staple for any restaurant that claims to serve authentic Cuban fare, but if you really want the best in the city, come to Rincon Criollo in Queens. The family-owned restaurant dates back to early 1950s Cuba, where the Acosta brothers first opened Rincon Criollo in the Santiago de Las Vegas area of Havana, where they served famous artists, baseball players, and politicians. After the Communist Revolution, the two youngest brothers re-opened the restaurant in New York City, bringing their family recipes with them, including the classic ropa vieja. Currently owned by the founder’s great-grandson, Rincon still prides itself on making even its Cuban-born customers feel like their abuela was cooking in the kitchen just for them. Havana may be 1,300 miles from New York, but the rich Cuban culture in the five boroughs means you can experience the best of the country without having to book a flight south. 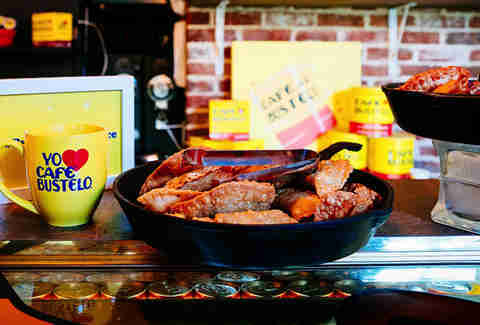 For a taste of Latin flavor right at home, there’s Café Bustelo’s espresso ground coffee. Because if there’s one thing that unites Cubans and New Yorkers, it’s that they both take coffee very seriously. Don’t be distracted by multi-tiered cakes displayed in the window of this bakery, one of the few Cuban-owned bakeries in Brooklyn -- it’s the pastelitos de guayaba, located in the glass pastry cases inside, that you’re really here for. While the guava paste-filled puff pastries are also popular in other Latin countries, the dessert is instantly recognizable to Cubans. The exact style ranges from place to place, but the pastelitos at La Gran Via, which opened in 1978, combine the super-sweet guava paste with a puff pastry dusted with powdered sugar, giving a light texture to the small treat. Despite what you’ve seen in Dirty Dancing: Havana Nights, Cuban salsa isn’t the ballroom-style, choreographed dance shown in the movie. 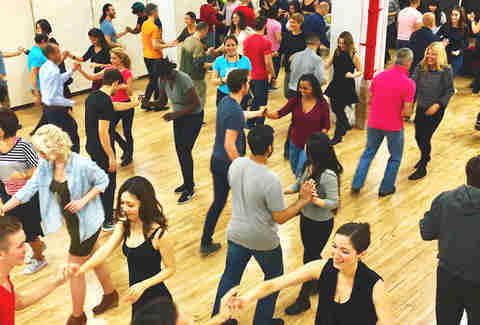 Also known as Rueda de Casino, Cuban salsa -- which is different from the more popularized Puerto Rican salsa -- is a group dance that involves a circle of multiple people who switch partners when someone gives a command. Dance company Fuákata teaches beginner, intermediate, and advanced Rueda classes at Adelante Studios in Manhattan; book a single drop-in class for $20 or a month of classes for $70. Also, among more than 80 fitness and dance classes per week at Ailey Extension, is their Afro Cuban Folkloric class, where you can learn the movement fundamentals of the dance as well as the cultural context. They teach different styles every week, such as the African-influenced Palo, which has origins in the Congo, and the Cuban rumba. Classes are suitable for beginners and more experienced dancers and cost $22/person, or new students can purchase two classes for $38. Imagine the New York City marathon, but instead of endurance runners taking over the five boroughs, it’s hundreds of dancers doing Cuban salsa. That’s Ruedathon. Every year, in celebration of the iconic Rueda de Casino dance style, the three-day long festival (September 28-30, 2018) stages flash mobs along a route similar to that of the 26.2-mile race. The event attracts casineros (as Rueda de Casino dancers are referred to), from across the city and the world, to dance by scenic NYC locations. As a spectator, catch them in the middle of Times Square, next to Yankee Stadium, inside Grand Central Terminal, at Gantry State Park Plaza, Staten Island Ferry’s Pier 1, and even while riding the A train. For a more high-brow dance experience, check out the Joyce Theater’s Cuba Festival. Fifteen years before the US started easing its travel restrictions to Cuba, members of the theater were making trips to the country to learn its traditional and folkloric dance styles directly from natives. After 17 trips by nearly 300 dancers and supporters, the idea for a festival bringing Cuban dance to the New York stage was born. The second annual event is set for January 9-20, 2019, and will feature performances by the Cuban groups Malpaso Dance Company, Los Hijos del Director, and Compañía Irene Rodríguez. If the measure of a true Cubano is that it follows the original recipe exactly, and perfectly proportions all of those ingredients, (and many people say it is), then Margon’s sandwich is the truest form you’ll find in the city. 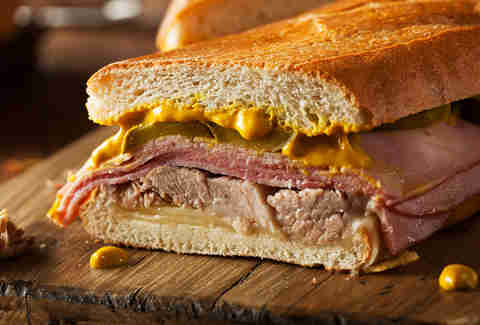 This hole-in-the-wall Cuban restaurant on West 46th Street takes the traditional roasted pork, ham, Swiss cheese, dill pickles, and mustard, layers it between slices of Cuban bread, then presses and grills it, resulting in a flavorful sandwich without any one ingredient overpowering another. The Cubano at 24-hour diner Coppelia on West 14th Street is also delicious, but controversial simply for the fact that its recipe includes chipotle mayonnaise along with the mustard. The addition of the spicy mayo gives the sandwich an added layer of flavor, which, if you’re open to straying from the tradition of a typical Cubano, is always a good idea -- whether you’re dining at 2pm or 2am. This annual festival, entering its 20th year, screens more than 25 Latin American films over two weeks in April throughout venues in Manhattan, Queens, and the Bronx. While its selections hail from not just Cuba but Argentina, Brazil, Chile, Colombia, Paraguay, Puerto Rico, Spain, and the US, there’s always a good Cuban representation; last year’s opening and closing night films were the Cuban comedy Sergio and Sergei and the documentary Cuban Food Stories, respectively. The lineup for next year’s festival, set for April 1-9, is TBD, but in addition to screenings, there are usually retrospectives and panel discussions with directors, actors, and producers. The programming is all in support of expanding the perception of Latino culture in the US by showing films rarely screened in this country, so grab tickets ($15 for single admission) and open your eyes to a new cultural experience.